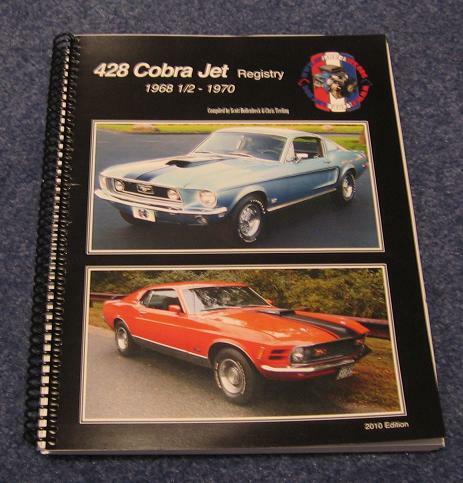 The Mustang 428 Cobra Jet Registry published our first registry book in April 2010. The book contains 275 pages of statistics, door tag decoding information, registered vehicle information (current as of February 2010), and part identification information. There are approximately 175 pages of color pictures! The book was published on 8.5" x 11" paper with a spiral binding for easy use as a reference. In the future we'll be adding more information describing the history of the Cobra Jet engine development program and the 50 "135" cars produced ahead of regular production. You can also expect to see more pictures of registered cars, updated registration statistics, and additional parts identification information. The 2010 edition of the book was published and sold by Applied Arts Publishers of Lancaster, PA. It went out of print in early 2018. Download the 2010 registry book in PDF format (22.3 MB).